As entertainment becomes a trillion-dollar-a-year industry worldwide, as our modern era increasingly lives up to its label of the "entertainment age," and as economists begin to recognize that entertainment has become the driving force of the new world economy, it is safe to say that scholars are beginning to take entertainment seriously. The scholarly spin on entertainment has been manifested in traditional ways, as well as innovative ones. Representing the current state of theory and research, Psychology of Entertainment promises to be the most comprehensive and up-to-date volume on entertainment. It serves to define the new area of study and provides a theoretical spin for future work in the area. *provides an opportunity for the application of well-established as well as emerging psychological and psychobiological theories to be applied to the study of entertainment in ways that seldom have been utilized previously. 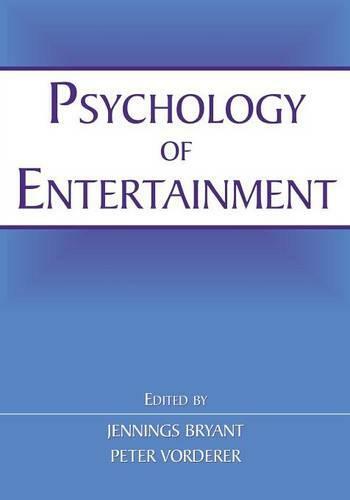 Psychology of Entertainment will appeal to scholars, researchers, and graduate students in media studies and mass communication, psychology, marketing, and other areas contributing to the entertainment studies area. "Happily, the contributors to 'Psychology of Entertainment', edited by Jennings Bryant and Peter Vorderer, dissect the subject of entertainment in an engaging, multifaceted, and nuanced fashion....this edited volume is consistent with the excellent tradition of the publishing house Erlbaum....The book's introduction promises a lot, and the book delivers a lot."